None of the leaders of the moderate Arab states ranted or even opened their mouths to respond to the statements made at Prime Minister Benjamin Netanyahu and US President Donald Trump’s press conference. There were no reactions either to the sentence that made headlines, when Trump stated nonchalantly that he doesn’t really care if the parties go for one state or two states. The commentators on the other side are looking for words and are making no effort to hide the despair. Among the polite ones, Trump is an enigma. Others are ready to swear that he is mainly ignorant on regional affairs and prefers to jump over puddles. 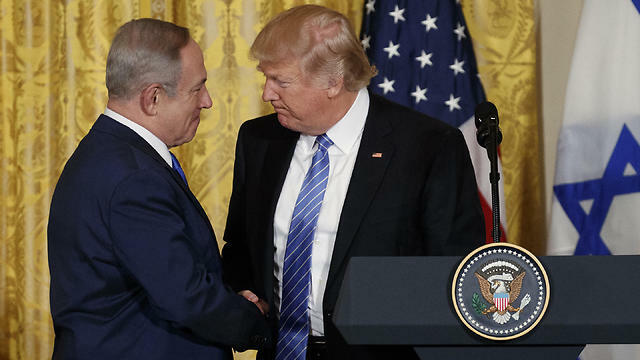 On the one hand, he gave the Palestinian state a dog’s burial and fulfilled his obligation when he asked Bibi to “hold off on settlements for a bit.” On the other hand, it’s actually thanks to Netanyahu, who understands the dangerous ramifications, that the American embassy is not moving (for now) to Jerusalem. “If they do it,” Arab League Secretary-General Ahmed Aboul-Gheit has warned, “the gates of hell will open.” To give a simple and clear explanation, the secretary-general has frightening numbers, tens of millions of people who will be prepared to take to the streets and partake in “operations,” should the administration insist on the move after all. My guess is that the leaders, the advisors and everyone in the decision-making circle in the Arab world did not miss even one second of the White House meeting. As far as they are concerned, Netanyahu got more than he dreamed of. Nevertheless, Trump heard what he heard from Jordan’s King Abdullah, a channel of communication was opened with Egyptian President Abdel Fattah al-Sisi, the CIA director visited Ramallah and Saudi King Abdullah’s palace found a way to relay messages to Washington. To what extent does Trump want to get his feet wet in the swamp of the Mideast conflict? He made some unbinding comment about a regional conference. As far as he is concerned, they can go for an inside-out solution, similar to what you order in a sushi restaurant. First big peace, then the conflict with the Palestinians, and then let’s wait and see. The nonsense tweeted by Minister Ayoob Kara has now been added to this whirlpool. Now let’s try to convince the other side that “Abu Damage” is simply looking for headlines. Let’s try to convince them that the minister on no affairs whatsoever doesn’t have a clue when he insists that Netanyahu arrived to strike a deal with Trump to establish a Palestinian state between Gaza and Sinai, at al-Sisi’s expense. On Thursday night, I took part in a long discussion on al-Jazeera’s daily news broadcast about our ambassador in Cairo, who has been stuck in Jerusalem since the end of the summer due to serious security warnings. The two people sitting in front of me during the broadcast, the editor of a newspaper in Cairo and Egyptian oppositionist Ayman Nour, who fled to Turkey, sent the viewers to Ayoob Kara’s irresponsible tweet. Now try to explain that this minister has a long history of chasing headlines, that a Palestinian state in Sinai is a nightmare rather than anyone’s dream, and that our democracy has gone crazy. An Arab summit is being planned in Amman at the end of next month. If they manage to overcome their internal battles, it won’t be a pleasant event for Israel. Jihad al-Hazen, one of the leading commentators in the Arab world, is already calling on Egypt and Jordan to announce that they are cancelling their peace agreements with Israel, in order to make Trump and his emissaries get their hands dirty. Trump has succeeded in confusing the leaders of the Arab world. There is no way to understand him or his plans. The way things look now, Iran and the Islamic State are at the top of his list. Meanwhile, on the other side, the security issues and the economic crises are the real headache. In the new road map, the silent moderates have no other choice but to tighten their relations with Jerusalem.